This past week, my mom and dad went on a little road trip and vacation to the west from their home in Missouri. Now that they are retired (and I use that word loosely considering all that they still do), they are traveling a lot more and taking little spur of the moment vacations here and there throughout the year. I come from a very blue collar home where my mom was a factory worker, jack of all trades, and housewife, while my dad was a third generation logger who worked a very dangerous and physically demanding job. I believe that I had one of the best childhoods possible with parents who loved me dearly, spent time with me, and taught me morals and values. We were not ever what could be considered rich monetarily (which I did not realize until I was an adult), but I was never in want for anything, and I was very rich in all other things in my life - love, home, and family. I'm so happy for my parents now who are able to take these little trips and enjoy their golden years after putting so much time, money, and effort into raising myself and my siblings. During their most recent trip, my mom told me that she handed out my business cards to everyone that would take one, and she left them in every little and big town that they stopped in along their journey. She's always been a social butterfly! I take more after my dad who is the quiet and reserved one. Nonetheless, I am very grateful and happy to have them as my number one fans! They are endlessly full of encouragement and talk about my creations and accomplishments as if I were a rock star or the President. 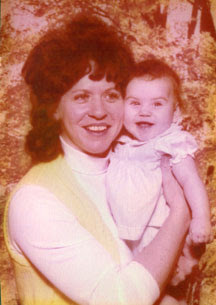 You can see a photo of my mom and I. It is a little faded and old (30+ years old to be exact), but it means the world to me. On a side note and as far as business is concerned, load up relatives and friends (who are willing) with your business cards. They may not be as diligent as my mom the social butterfly, but those that know and love you can be your best advertisers! And, hopefully they will appreciate what you are doing more than anyone else. Very nice post! You are very blessed! That's sweet of your mom to do. It's so great to have the support of your family ! I don't know what would I do without my mother ! What a great idea! Your Mom is a great representative for you.